Find a pumpkin for your pumpkins! Perfect pumpkin picking -- say that 10 times fast! In San Diego, it’s easy to pick a perfect pumpkin because we have so many amazing pumpkin patches. Most of them are located on sprawling farms that offer families -- or kiddos out with the nanny or babysitter -- a whole afternoon of fun. These pumpkin patches don’t just grow adorable pumpkins. They also include fun attractions like hayrides, petting zoos, crafts, rides, and many, many photo opportunities. 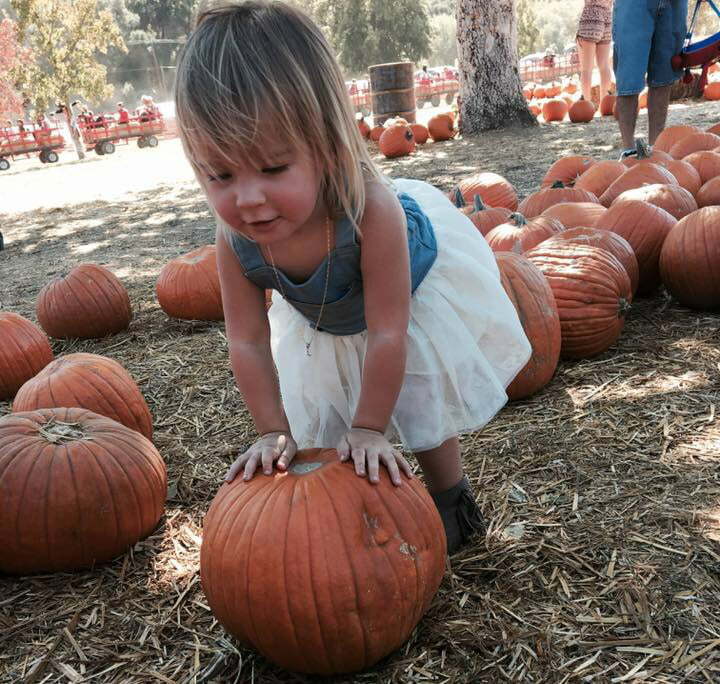 Just sit your toddler on a pumpkin… et voilà! 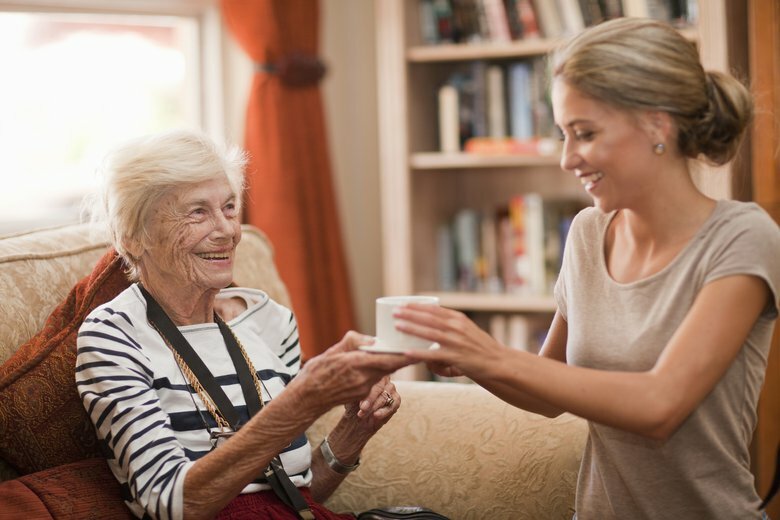 You have the most adorable fall photo imaginable! Easy on the wallet and easy to enjoy with our San Diego weather, the following pumpkin patches will make everyone in your family happy. Dates & Hours: Monday - Thursday, 9 a.m. - 5:30 p.m. | Friday (Oct.13, 20, 21), 9 a.m. - 8 p.m. | Saturday & Sunday, 8:30 a.m. - 6 p.m.
Bates Nut Farm has been around for more than 50 years and is an October destination for many San Diego families. The Pumpkin Patch at Bates is huge! By changing the area of the pumpkin patch every year, the farmers keep the soil healthy and produce prime pumpkins, including Big Macs, Ghost, and Cinderella pumpkins, as well as those adorable tiny ones. 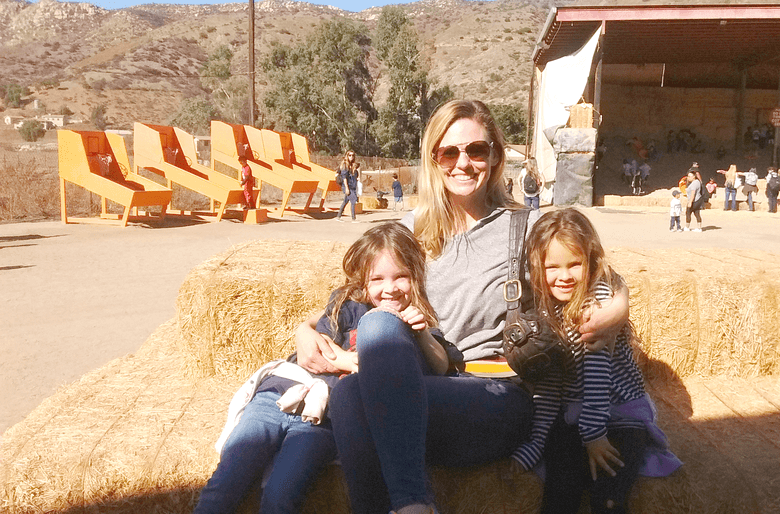 There’s a ton to do at this beautiful farm, located deep in Escondido. It’s usually pretty crowded and sometimes hot, so dress accordingly. 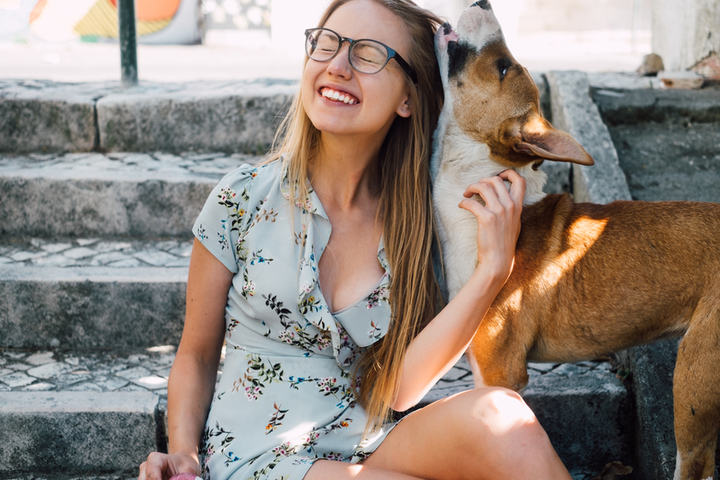 There are tons of food and drink trucks and treats for all, as well as a petting zoo and animals behind gates that you can view, like chickens, pigs, llamas, and goats. Kids will have fun getting their face painted or having a balloon made. There’s live music, and you’ll find plenty of picnic tables and hay bales to sit on while you listen. And tractor rides take you around the farm! Dates & Hours: Open daily, 9 a.m. - 6 p.m. The Cannon Stand in Carlsbad has been around since 1948. The farm is a huge strawberry producer, but in October, all you’ll be interested in are the pumpkins! The Pumpkin Patch opens in October for families to come and choose a beautiful pumpkin for their Halloween celebration. The Cannon Stand also offers a fun corn maze, which is $5 for kids and $7 for adults. 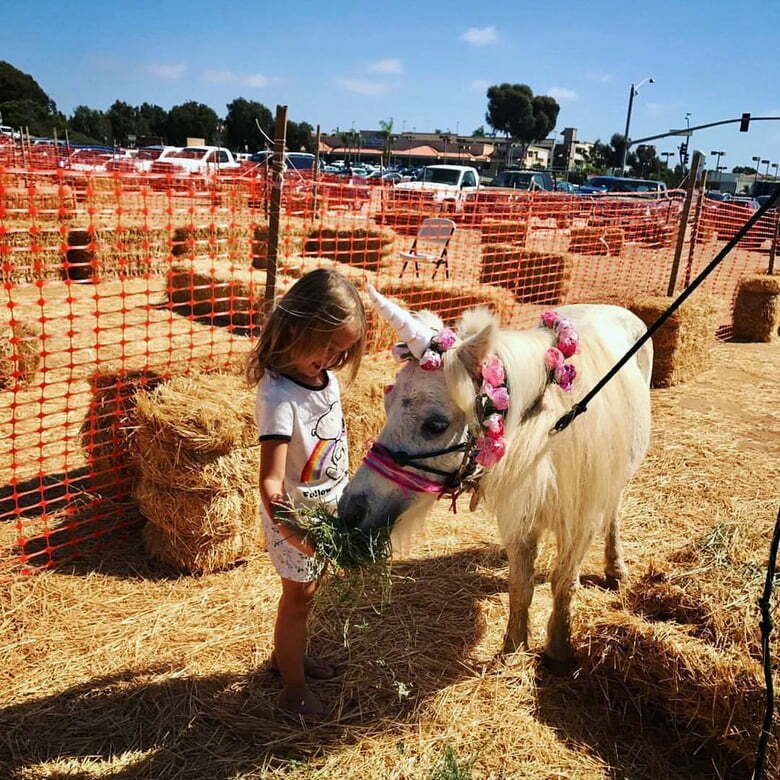 Kids can feed ponies, and there’s also the seasonal tractor and hayrides on Saturdays and Sundays. Hours: Saturday, 10 a.m. - 5 p.m. | Sunday, 12 a.m. - 5 p.m. The Julian Mining Company is a charming place to pick your pumpkin. Julian is up in the mountains, gorgeous in the fall, and the perfect place to spend an October day with the whole family. It offers apple picking, as well as the seasonal pumpkins. And you can pan for gold, which starts at $6.95 for kids. 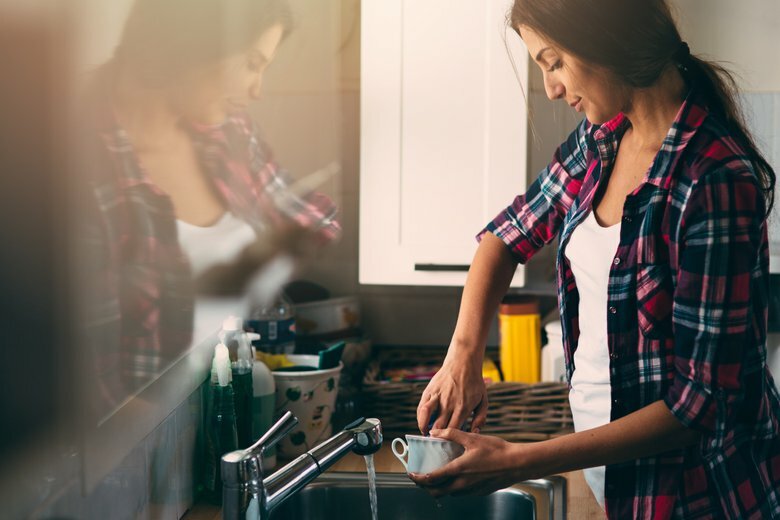 Gem mining, which starts at $11.53, is hugely popular for children, and they get to go home with brightly colored gems they caught through sluicing water. Be sure to stop and get some famous Julian apple pie on your way out! Hours: Open daily, 9 a.m. - 8 p.m.
Temecula is a slight drive from San Diego County, but this family-owned farm is worth it. There’s a “Charlotte’s Web” feel to Peltzer Farms, with tons of attractions like a railroad ride on a 12-passenger train that goes through the pumpkin patch, pig races, a petting farm, and more! There’s typically a corn maze, but unfortunately, that was canceled this year due to the drought. Although there is no entrance fee, the attractions do cost money. The pony rides are $5 per child, the petting farm is $2 per person, and gem mining is $5 per person. The tractor garden and pig races are free! Hours: Open daily, 10 a.m. - 6 p.m. The Farm Stand West is paired with Fran’s Original Farm Stand, also in Escondido, and also with October pumpkin patches for San Diegans to enjoy. Family owned and operated since its humble beginnings in the late ’60s, this farm is a charming place to spend a fall afternoon. The pick-your-own pumpkin patch is open through the last day of October, and you can browse the farm with your kids, walking through the unique labyrinth made of pumpkins. You might even want to stop and buy some of their other freshly grown produce while you’re there. Address & Hours: Vary by location. Click here for details. 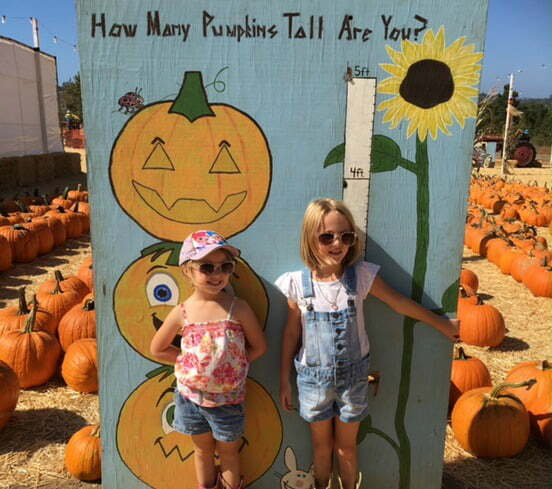 Pinery Farms Pumpkin Stations are spread out in six different San Diego County locations through Oct. 31: Del Mar, Rancho Bernardo, Mission Valley, El Cajon, National City, and Bonita. Each location offers prime pumpkin picking! All the locations have fun fall activities for kiddos: giant slides, inflatable jumpies, petting zoos, game zones, a corn maze, and train rides. Tickets for the rides start at $2. Prices for other attractions vary, with some attractions being free, depending on the location. 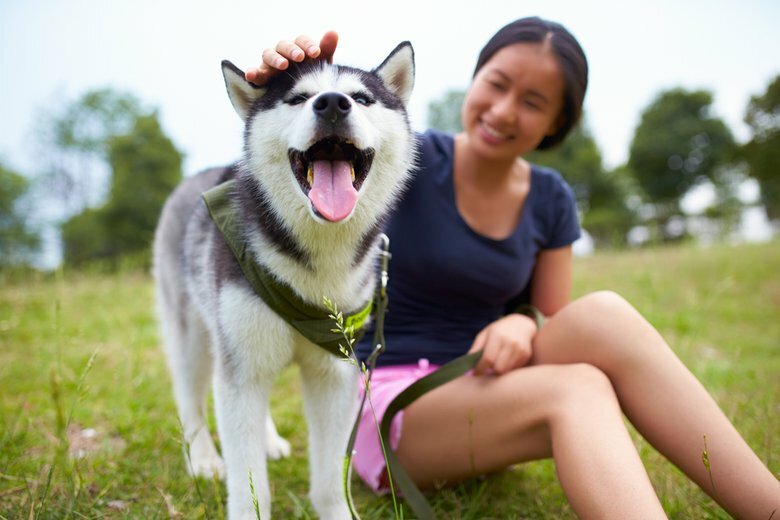 There are no dogs are allowed, so leave the pooch at home! Hours: Open daily, 9 a.m. - 6 p.m.
It’s the 20th anniversary of Mountain Valley Ranch! In honor of that milestone, the owners are donating 10 percent of their profits to the San Diego chapter of the American Cancer Society. 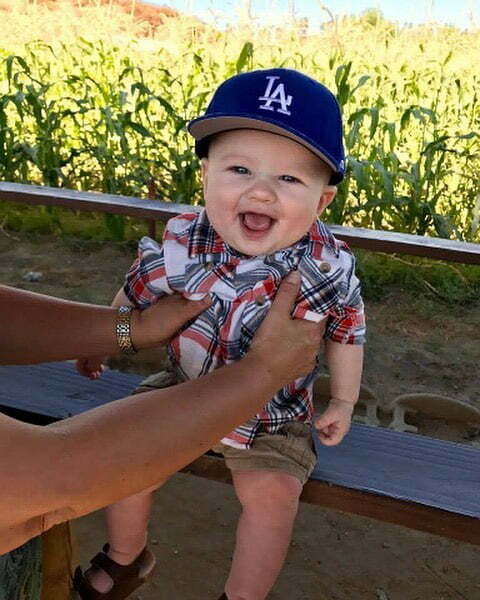 Set in Ramona, the farm is surrounded with rolling hills and a wide open sky. Come enjoy their pumpkin patch and stay with your children for a pony ride or a hayride, or pop through the corn maze. Tickets for activities can be bought with cash or credit, though there is a minimum charge of $10 for credit cards. Hours: Wednesday - Saturday, 9 a.m. - 5 p.m. | Sunday, 10 a.m. - 5 p.m. 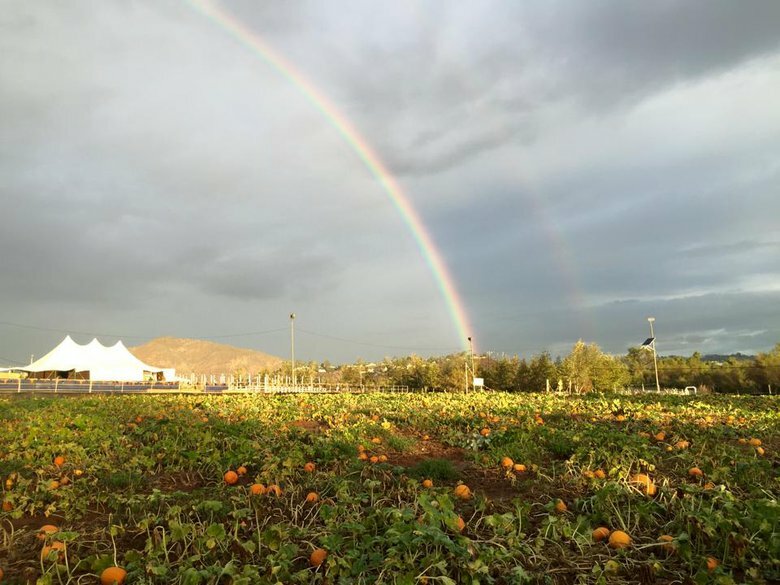 This gorgeous farm in El Cajon features a lovely pumpkin patch for you to pick your own pumpkin in the gorgeous countryside. Be sure to dress for pretty warm weather and wear sunblock, because this part of the city is still blazing hot in the fall. The weekend offers a jumpy house, popcorn and coffee bars, and gorgeous shops full of charming country offerings like canned goods and handmade chairs. Oct. 21 features poultry and small animals, and Oct. 22 features alpacas. 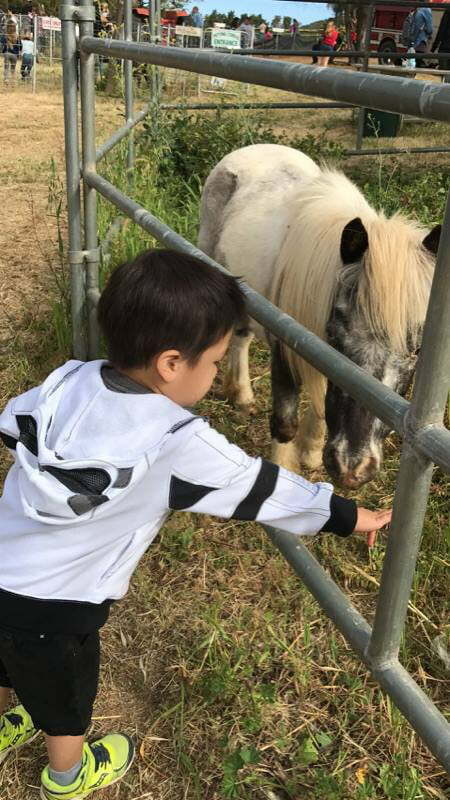 Hours: Tuesday - Saturday, 10 a.m. - 7 p.m.
Oma’s Pumpkin Patch is located in East County and offers a bevy of fun for the admission fee, including a Jack Patch pumpkin, a water bottle, and access to the petting zoo, hay maze, hayrides, and all the fall attractions and games. In addition to the often-found delights of a fall farm, Oma’s Pumpkin Patch has a cotton seed climb, where kids climb up mounds of cotton seeds and slide down, and a large sand pile with sand trucks and toys for kiddos to play with. 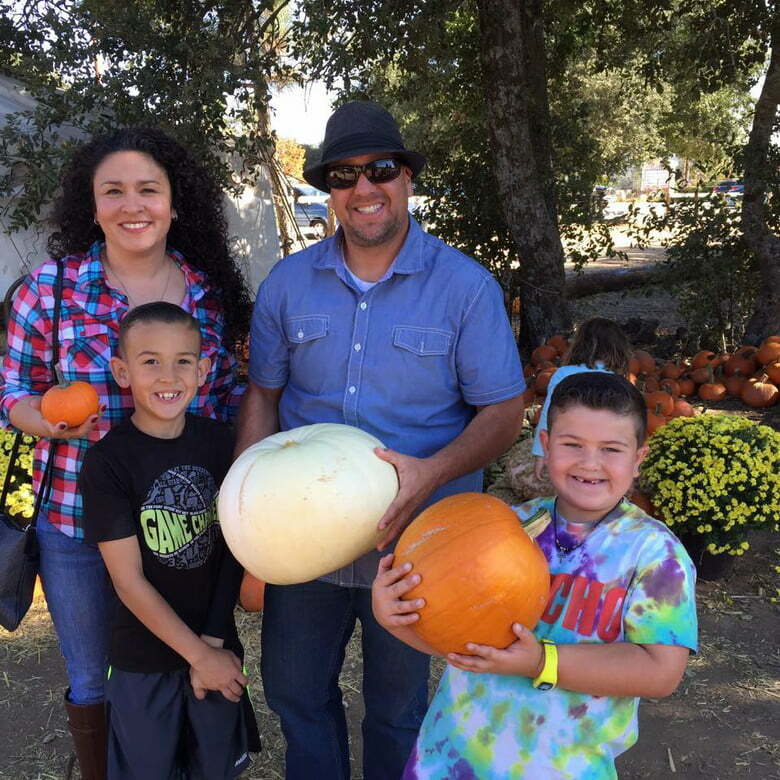 Stehly Farms Organics is a large, historic farm ripe with fruits and vegetables growing, animals grazing, and pumpkins clustered in a patch for the kids to pick. The pumpkins are organic (a la the name of the farm) and gorgeous. Taking kids to this farm is a great way to sneak some enjoyable learning into your outing: In addition to the opportunity to teach the little ones about what “organic” really means, you can talk about how Stehly Farms is working to be sustainable and uses solar energy. Kids will love to look at the solar panels and learn how the sun can power a whole farm. 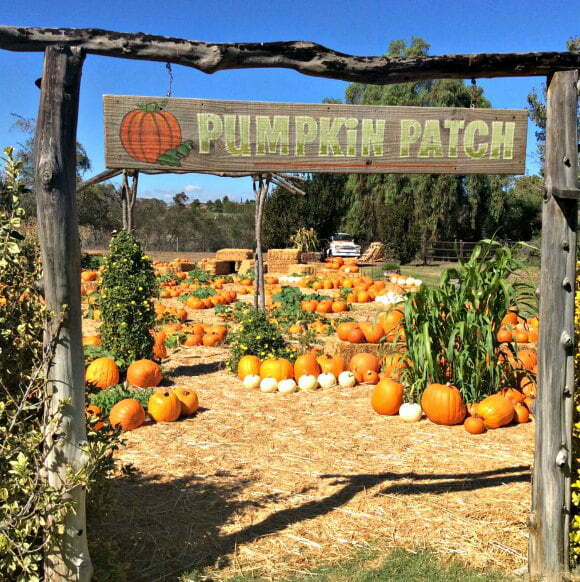 Did we list all the best pumpkin patches around San Diego? Let us know in the comments below! Had no idea there were so many pumpkin patches around San Diego! Really fun thing to do with young kids.